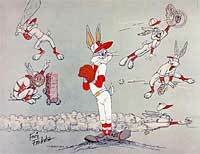 Baseball Bugs – This fine art Hand Painted Limited Edition Cel features Bugs Bunny in his most famous game against the Gashouse Gorillas…one of the most sought after cels ever released. Yerrrrrr Oooouuutt!!! 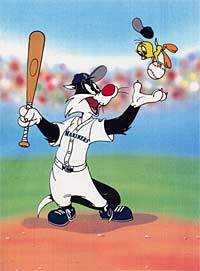 – This fine art Hand Painted Limited Edition Cel features progressive images of Bugs Bunny diving for home plate and finally getting called by the Ump. 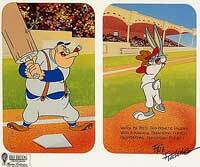 Palooka Pitch – Inspired by the same cartoon as the Baseball Bugs and Yer Out, this fabulous fine art Hand Painted Limited Edition Cel features two moments in the classic cartoon short. Each work of art is hand-signed by legend Friz Freleng. Keep Your Eye On The Tweety – Inspired by classic Warner Bros. cartoons Charles & Tom McKimson created this fabulous fine art Limited Edition Lithograph. Each work of art is hand-signed by the McKimsons, and by Randy Johnson.